Troy residents! The best carpet installers are now right in your backyard! If you're in the process of shopping for new carpet in Troy, Michigan, you've come to the right place. The Carpet Guys carry the best quality brand name carpeting on our shelves, and we're ready to pass it on to you for fair and affordable carpet prices. Being in business for as long as we have, we've learned what it takes to make custromers happy. We've taken those methods and added them into our installation process. So you do not have to, we move your furniture for you. Our installers are there to serve you, so its no problem for us to do it. The old carpet is ripped up, cut into small portions, and neatly placed out on the curb (if applicable). We then begin the process of installing your new carpeting. Yur satisfaction is guaranteed by our professional installations and a lifetime warranty. We understand that it can be unnerving trying to find a good Troy carpet installer. That's why we offer all of these different things to our customers. It is important to us that you are comfortable and happy. If you are ready to have new carpeting installed in your home, let The Carpet Guys take care of it all. 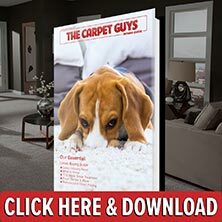 Take the time to fill out a free carpet estimate via our website or call in today and experience just how fun it can be to shop for new carpeting.